An electric current is the rate of flow of electric charge past a point:2:622 or region. :614 An electric current is said to exist when there is a net flow of electric charge through a region. :832 In electric circuits this charge is often carried by electrons moving through a wire. It can also be carried by ions in an electrolyte, or by both ions and electrons such as in an ionized gas (plasma). The conventional symbol for current is I, which originates from the French phrase intensité du courant, (current intensity). Current intensity is often referred to simply as current. The I symbol was used by André-Marie Ampère, after whom the unit of electric current is named, in formulating Ampère's force law (1820). The notation travelled from France to Great Britain, where it became standard, although at least one journal did not change from using C to I until 1896. The electrons, the charge carriers in an electrical circuit, flow in the opposite direction of the conventional electric current. The symbol for a battery in a circuit diagram. In a conductive material, the moving charged particles that constitute the electric current are called charge carriers. In metals, which make up the wires and other conductors in most electrical circuits, the positively charged atomic nuclei of the atoms are held in a fixed position, and the negatively charged electrons are the charge carriers, free to move about in the metal. In other materials, notably the semiconductors, the charge carriers can be positive or negative, depending on the dopant used. Positive and negative charge carriers may even be present at the same time, as happens in an electrolyte in an electrochemical cell. 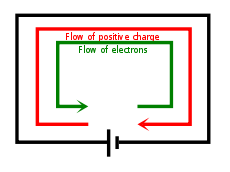 A flow of positive charges gives the same electric current, and has the same effect in a circuit, as an equal flow of negative charges in the opposite direction. Since current can be the flow of either positive or negative charges, or both, a convention is needed for the direction of current that is independent of the type of charge carriers. The direction of conventional current is arbitrarily defined as the same direction as positive charges flow. Since the current in a wire or component can flow in either direction, when a variable I is defined to represent that current, the direction representing positive current must be specified, usually by an arrow on the circuit schematic diagram. This is called the reference direction of current I. If the current flows in the opposite direction, the variable I has a negative value. When analyzing electrical circuits, the actual direction of current through a specific circuit element is usually unknown. Consequently, the reference directions of currents are often assigned arbitrarily. When the circuit is solved, a negative value for the variable means that the actual direction of current through that circuit element is opposite that of the chosen reference direction. In electronic circuits, the reference current directions are often chosen so that all currents are toward ground. This often corresponds to the actual current direction, because in many circuits the power supply voltage is positive with respect to ground. In alternating current (AC) systems, the movement of electric charge periodically reverses direction. AC is the form of electric power most commonly delivered to businesses and residences. The usual waveform of an AC power circuit is a sine wave. Certain applications use different waveforms, such as triangular or square waves. Audio and radio signals carried on electrical wires are also examples of alternating current. An important goal in these applications is recovery of information encoded (or modulated) onto the AC signal. In contrast, direct current (DC) is the unidirectional flow of electric charge, or a system in which the movement of electric charge is in one direction only. Direct current is produced by sources such as batteries, thermocouples, solar cells, and commutator-type electric machines of the dynamo type. Direct current may flow in a conductor such as a wire, but can also flow through semiconductors, insulators, or even through a vacuum as in electron or ion beams. An old name for direct current was galvanic current. Natural observable examples of electrical current include lightning, static electric discharge, and the solar wind, the source of the polar auroras. Man-made occurrences of electric current include the flow of conduction electrons in metal wires such as the overhead power lines that deliver electrical energy across long distances and the smaller wires within electrical and electronic equipment. Eddy currents are electric currents that occur in conductors exposed to changing magnetic fields. Similarly, electric currents occur, particularly in the surface, of conductors exposed to electromagnetic waves. When oscillating electric currents flow at the correct voltages within radio antennas, radio waves are generated. In electronics, other forms of electric current include the flow of electrons through resistors or through the vacuum in a vacuum tube, the flow of ions inside a battery or a neuron, and the flow of holes within metals and semiconductors. Current can be measured using an ammeter. Electric current can be directly measured with a galvanometer, but this method involves breaking the electrical circuit, which is sometimes inconvenient. Joule heating, also known as ohmic heating and resistive heating, is the process of power dissipation:36 by which the passage of an electric current through a conductor increases the internal energy of the conductor:846, converting thermodynamic work into heat. :846, fn. 5 The phenomenon was first studied by James Prescott Joule in 1841. Joule immersed a length of wire in a fixed mass of water and measured the temperature rise due to a known current through the wire for a 30 minute period. By varying the current and the length of the wire he deduced that the heat produced was proportional to the square of the current multiplied by the electrical resistance of the wire. In an electromagnet a coil of wires behaves like a magnet when an electric current flows through it. When the current is switched off, the coil loses its magnetism immediately. According to Ampère's circuital law, an electric current produces a magnetic field. Electric current produces a magnetic field. The magnetic field can be visualized as a pattern of circular field lines surrounding the wire that persists as long as there is current. Magnetic fields can also be used to make electric currents. When a changing magnetic field is applied to a conductor, an electromotive force (EMF) is induced,:1004 which starts an electric current, when there is a suitable path. When an electric current flows in a suitably shaped conductor at radio frequencies, radio waves can be generated. These travel at the speed of light and can cause electric currents in distant conductors. In metallic solids, electric charge flows by means of electrons, from lower to higher electrical potential. In other media, any stream of charged objects (ions, for example) may constitute an electric current. To provide a definition of current independent of the type of charge carriers, conventional current is defined as moving in the same direction as the positive charge flow. So, in metals where the charge carriers (electrons) are negative, conventional current is in the opposite direction as the electrons. In conductors where the charge carriers are positive, conventional current is in the same direction as the charge carriers. In a vacuum, a beam of ions or electrons may be formed. In other conductive materials, the electric current is due to the flow of both positively and negatively charged particles at the same time. In still others, the current is entirely due to positive charge flow. For example, the electric currents in electrolytes are flows of positively and negatively charged ions. In a common lead-acid electrochemical cell, electric currents are composed of positive hydronium ions flowing in one direction, and negative sulfate ions flowing in the other. Electric currents in sparks or plasma are flows of electrons as well as positive and negative ions. In ice and in certain solid electrolytes, the electric current is entirely composed of flowing ions. In a metal, some of the outer electrons in each atom are not bound to the individual atom as they are in insulating materials, but are free to move within the metal lattice. These conduction electrons can serve as charge carriers, carrying a current. Metals are particularly conductive because there are a large number of these free electrons, typically one per atom in the lattice. With no external electric field applied, these electrons move about randomly due to thermal energy but, on average, there is zero net current within the metal. At room temperature, the average speed of these random motions is 106 metres per second. Given a surface through which a metal wire passes, electrons move in both directions across the surface at an equal rate. As George Gamow wrote in his popular science book, One, Two, Three...Infinity (1947), "The metallic substances differ from all other materials by the fact that the outer shells of their atoms are bound rather loosely, and often let one of their electrons go free. Thus the interior of a metal is filled up with a large number of unattached electrons that travel aimlessly around like a crowd of displaced persons. When a metal wire is subjected to electric force applied on its opposite ends, these free electrons rush in the direction of the force, thus forming what we call an electric current." When a metal wire is connected across the two terminals of a DC voltage source such as a battery, the source places an electric field across the conductor. The moment contact is made, the free electrons of the conductor are forced to drift toward the positive terminal under the influence of this field. The free electrons are therefore the charge carrier in a typical solid conductor. where Q is the electric charge transferred through the surface over a time t. If Q and t are measured in coulombs and seconds respectively, I is in amperes. Electric currents in electrolytes are flows of electrically charged particles (ions). For example, if an electric field is placed across a solution of Na+ and Cl− (and conditions are right) the sodium ions move towards the negative electrode (cathode), while the chloride ions move towards the positive electrode (anode). Reactions take place at both electrode surfaces, neutralizing each ion. Water-ice and certain solid electrolytes called proton conductors contain positive hydrogen ions ("protons") that are mobile. In these materials, electric currents are composed of moving protons, as opposed to the moving electrons in metals. In certain electrolyte mixtures, brightly coloured ions are the moving electric charges. The slow progress of the colour makes the current visible. In air and other ordinary gases below the breakdown field, the dominant source of electrical conduction is via relatively few mobile ions produced by radioactive gases, ultraviolet light, or cosmic rays. Since the electrical conductivity is low, gases are dielectrics or insulators. However, once the applied electric field approaches the breakdown value, free electrons become sufficiently accelerated by the electric field to create additional free electrons by colliding, and ionizing, neutral gas atoms or molecules in a process called avalanche breakdown. The breakdown process forms a plasma that contains enough mobile electrons and positive ions to make it an electrical conductor. In the process, it forms a light emitting conductive path, such as a spark, arc or lightning. Plasma is the state of matter where some of the electrons in a gas are stripped or "ionized" from their molecules or atoms. A plasma can be formed by high temperature, or by application of a high electric or alternating magnetic field as noted above. Due to their lower mass, the electrons in a plasma accelerate more quickly in response to an electric field than the heavier positive ions, and hence carry the bulk of the current. The free ions recombine to create new chemical compounds (for example, breaking atmospheric oxygen into single oxygen [O2 → 2O], which then recombine creating ozone [O3]). Since a "perfect vacuum" contains no charged particles, it normally behaves as a perfect insulator. However, metal electrode surfaces can cause a region of the vacuum to become conductive by injecting free electrons or ions through either field electron emission or thermionic emission. Thermionic emission occurs when the thermal energy exceeds the metal's work function, while field electron emission occurs when the electric field at the surface of the metal is high enough to cause tunneling, which results in the ejection of free electrons from the metal into the vacuum. Externally heated electrodes are often used to generate an electron cloud as in the filament or indirectly heated cathode of vacuum tubes. Cold electrodes can also spontaneously produce electron clouds via thermionic emission when small incandescent regions (called cathode spots or anode spots) are formed. These are incandescent regions of the electrode surface that are created by a localized high current. These regions may be initiated by field electron emission, but are then sustained by localized thermionic emission once a vacuum arc forms. These small electron-emitting regions can form quite rapidly, even explosively, on a metal surface subjected to a high electrical field. Vacuum tubes and sprytrons are some of the electronic switching and amplifying devices based on vacuum conductivity. Superconductivity is a phenomenon of exactly zero electrical resistance and expulsion of magnetic fields occurring in certain materials when cooled below a characteristic critical temperature. It was discovered by Heike Kamerlingh Onnes on April 8, 1911 in Leiden. Like ferromagnetism and atomic spectral lines, superconductivity is a quantum mechanical phenomenon. It is characterized by the Meissner effect, the complete ejection of magnetic field lines from the interior of the superconductor as it transitions into the superconducting state. The occurrence of the Meissner effect indicates that superconductivity cannot be understood simply as the idealization of perfect conductivity in classical physics. In a semiconductor it is sometimes useful to think of the current as due to the flow of positive "holes" (the mobile positive charge carriers that are places where the semiconductor crystal is missing a valence electron). This is the case in a p-type semiconductor. A semiconductor has electrical conductivity intermediate in magnitude between that of a conductor and an insulator. This means a conductivity roughly in the range of 10−2 to 104 siemens per centimeter (S⋅cm−1). In the classic crystalline semiconductors, electrons can have energies only within certain bands (i.e. ranges of levels of energy). Energetically, these bands are located between the energy of the ground state, the state in which electrons are tightly bound to the atomic nuclei of the material, and the free electron energy, the latter describing the energy required for an electron to escape entirely from the material. The energy bands each correspond to a large number of discrete quantum states of the electrons, and most of the states with low energy (closer to the nucleus) are occupied, up to a particular band called the valence band. Semiconductors and insulators are distinguished from metals because the valence band in any given metal is nearly filled with electrons under usual operating conditions, while very few (semiconductor) or virtually none (insulator) of them are available in the conduction band, the band immediately above the valence band. The ease of exciting electrons in the semiconductor from the valence band to the conduction band depends on the band gap between the bands. The size of this energy band gap serves as an arbitrary dividing line (roughly 4 eV) between semiconductors and insulators. With covalent bonds, an electron moves by hopping to a neighboring bond. The Pauli exclusion principle requires that the electron be lifted into the higher anti-bonding state of that bond. For delocalized states, for example in one dimension – that is in a nanowire, for every energy there is a state with electrons flowing in one direction and another state with the electrons flowing in the other. For a net current to flow, more states for one direction than for the other direction must be occupied. For this to occur, energy is required, as in the semiconductor the next higher states lie above the band gap. Often this is stated as: full bands do not contribute to the electrical conductivity. However, as a semiconductor's temperature rises above absolute zero, there is more energy in the semiconductor to spend on lattice vibration and on exciting electrons into the conduction band. The current-carrying electrons in the conduction band are known as free electrons, though they are often simply called electrons if that is clear in context. is the resistance, measured in ohms. For alternating currents, especially at higher frequencies, skin effect causes the current to spread unevenly across the conductor cross-section, with higher density near the surface, thus increasing the apparent resistance. is the charge on each particle. Typically, electric charges in solids flow slowly. For example, in a copper wire of cross-section 0.5 mm2, carrying a current of 5 A, the drift velocity of the electrons is on the order of a millimetre per second. To take a different example, in the near-vacuum inside a cathode ray tube, the electrons travel in near-straight lines at about a tenth of the speed of light. Any accelerating electric charge, and therefore any changing electric current, gives rise to an electromagnetic wave that propagates at very high speed outside the surface of the conductor. This speed is usually a significant fraction of the speed of light, as can be deduced from Maxwell's Equations, and is therefore many times faster than the drift velocity of the electrons. For example, in AC power lines, the waves of electromagnetic energy propagate through the space between the wires, moving from a source to a distant load, even though the electrons in the wires only move back and forth over a tiny distance. The ratio of the speed of the electromagnetic wave to the speed of light in free space is called the velocity factor, and depends on the electromagnetic properties of the conductor and the insulating materials surrounding it, and on their shape and size. The random motion of charges is analogous to heat – the thermal velocity of randomly vibrating gas particles. Look up amperage in Wiktionary, the free dictionary. ^ Horowitz, Paul; Hill, Winfield (2015). The art of electronics (3rd ed.). Cambridge University Press. ISBN 978-0-521-80926-9. ^ a b c d e Walker, Jearl; Halliday, David; Resnick, Robert (2014). Fundamentals of physics (10th ed.). Hoboken, NJ: Wiley. ISBN 9781118230732. OCLC 950235056. ^ a b c d Serway, Raymond A.; Jewett, John W. (2004). Physics for Scientists and Engineers (6th ed.). Thomson Brooks/Cole. ISBN 0-534-40842-7. ^ Anthony C. Fischer-Cripps (2004). The electronics companion. CRC Press. p. 13. ISBN 978-0-7503-1012-3. ^ T. L. Lowe, John Rounce, Calculations for A-level Physics, p. 2, Nelson Thornes, 2002 ISBN 0-7487-6748-7. ^ Howard M. Berlin, Frank C. Getz, Principles of Electronic Instrumentation and Measurement, p. 37, Merrill Pub. Co., 1988 ISBN 0-675-20449-6. ^ K. S. Suresh Kumar, Electric Circuit Analysis, Pearson Education India, 2013, ISBN 9332514100, section 1.2.3 "'Current intensity' is usually referred to as 'current' itself." ^ A-M Ampère, Recueil d'Observations Électro-dynamiques, p. 56, Paris: Chez Crochard Libraire 1822 (in French). ^ Consoliver, Earl L.; Mitchell, Grover I. (1920). Automotive ignition systems. McGraw-Hill. p. 4. ^ Robert A. Millikan and E. S. Bishop (1917). Elements of Electricity. American Technical Society. p. 54. ^ Oliver Heaviside (1894). Electrical papers. 1. Macmillan and Co. p. 283. ISBN 978-0-8218-2840-3. ^ Andrew J. Robinson; Lynn Snyder-Mackler (2007). Clinical Electrophysiology: Electrotherapy and Electrophysiologic Testing (3rd ed.). Lippincott Williams & Wilkins. p. 10. ISBN 978-0-7817-4484-3. ^ What is a Current Sensor and How is it Used?. Focus.ti.com. Retrieved on 2011-12-22. ^ Andreas P. Friedrich, Helmuth Lemme The Universal Current Sensor. Sensorsmag.com (2000-05-01). Retrieved on 2011-12-22. ^ a b Jaffe, Robert L.; Taylor, Washington (2018). The physics of energy. Cambridge University Press. ^ "The Mechanism Of Conduction In Metals", Think Quest. ^ Rudolf Holze, Experimental Electrochemistry: A Laboratory Textbook, page 44, John Wiley & Sons, 2009 ISBN 3527310983. ^ Zangwill, Andrew (2013). Modern Electrodynamics. Cambridge University Press. ISBN 978-0-521-89697-9.